Business and the businessman have had a fundamental place in American society since the inception of the nation. 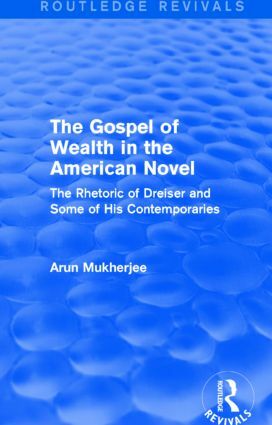 This tenet, the ‘gospel of wealth’, is a central concern in the novels of Theodore Dreiser and his contemporaries. First published in 1987, this study aims to set this group of writers in their historical context and to show how they elaborated the idea of wealth as an object of quasi-religious quest. What had previously been associated with disease and darkness, avarice and dishonour, now came to emblematise the virtues of thrift, prudence and diligence. The underlying argument is that the dominant group of a society legitimises its power through the appropriation of the vocabulary of religion, and the American business leaders were successful in doing this both in their own practice and through the more insidious medium of art. A detailed analysis, this reissue will be of particular value to students of American literature with an interest in the relationship between linguistic symbols and social order, and historical attitudes towards wealth in literature.